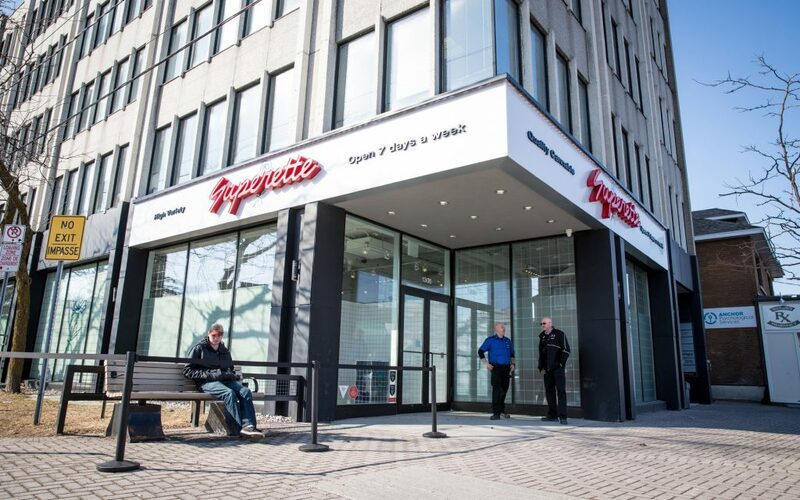 Superette in Ottawa occupies a corner unit on Wellington St. W. at Grange Ave., a vibrant neighbourhood populated by restaurants and cafes. 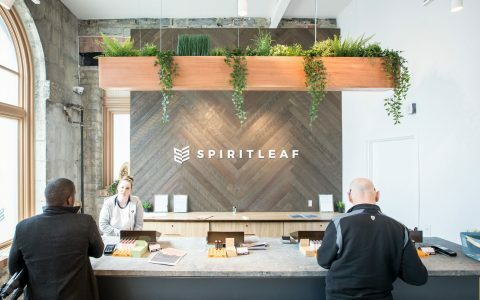 Co-founded by Mimi Lam and Drummond Munro, and licensed through Pure Alpha Holdings Ltd. (the winner of the Ontario retail lottery), the store is designed to accommodate new and experienced cannabis consumers alike. 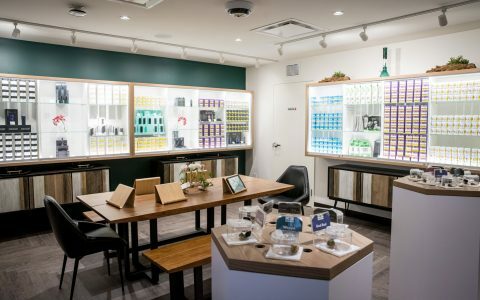 Drawing inspiration from grocery and convenience stores that Canadians are already accustomed to, Superette eases customers into the new world of cannabis retail by creating a familiar setting where shoppers are invited to browse independently or engage with customer service representatives as they wish. 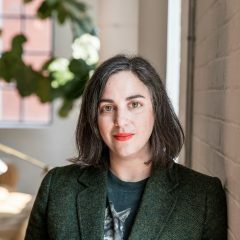 Superette stands out for its fresh aesthetic that simultaneously feels familiar. The interior scheme at Superette is convenience store-meets-soda fountain. 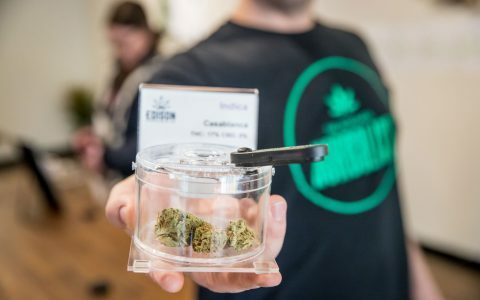 Pegboards propped with cannabis-adjacent products: vaporizers, pipes, papers, infusers, merch, and more are displayed throughout the store while cannabis can be ordered at the counter. 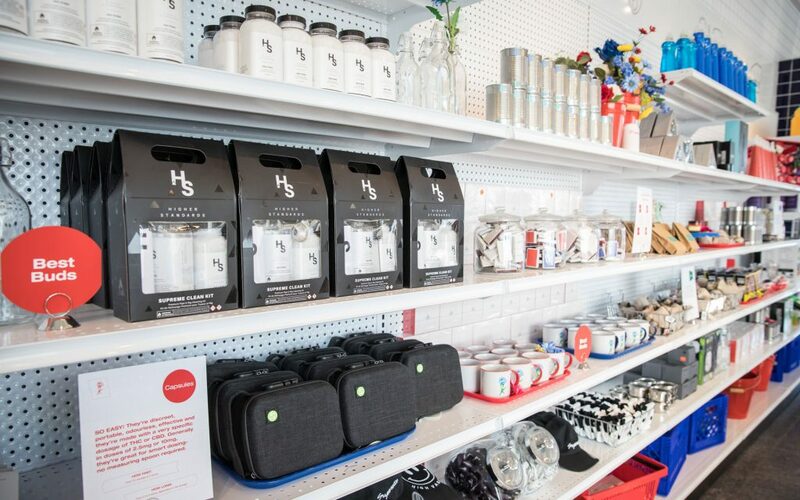 The Superette shopping experience is a choose-your-own-adventure. 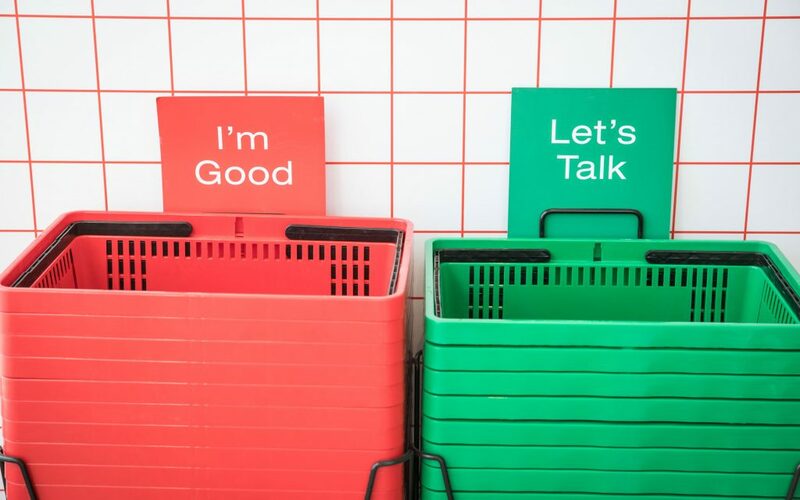 Those that want to browse in peace can grab a red shopping basket, while those that know what they want going in can just beeline to the express counter and order off a menu for quick service without the Q&A. 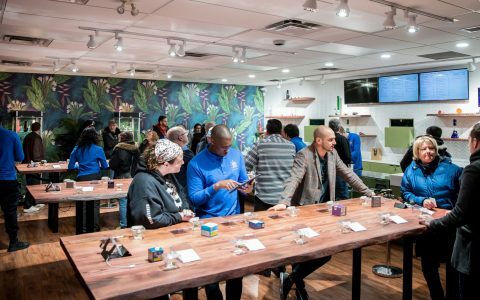 Consumers looking for guidance can express their interest by grabbing a green basket and then chatting up budtenders working the room. 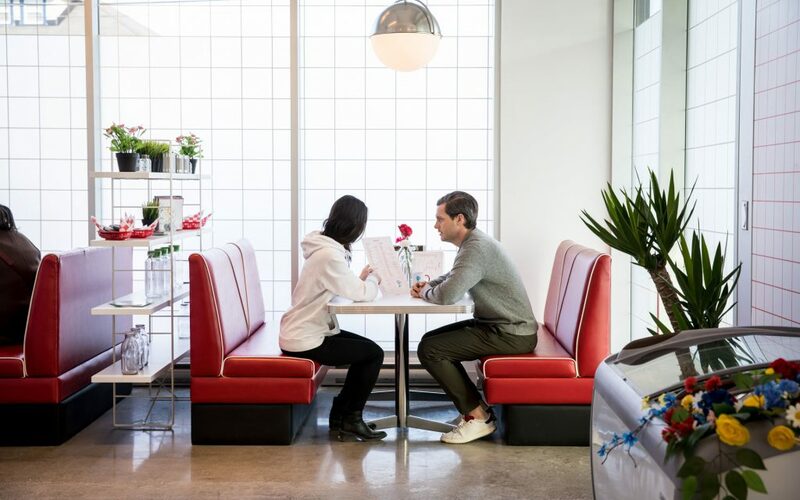 Comfy vinyl booths and chrome stools at the counter offer dedicated spaces for consultations. 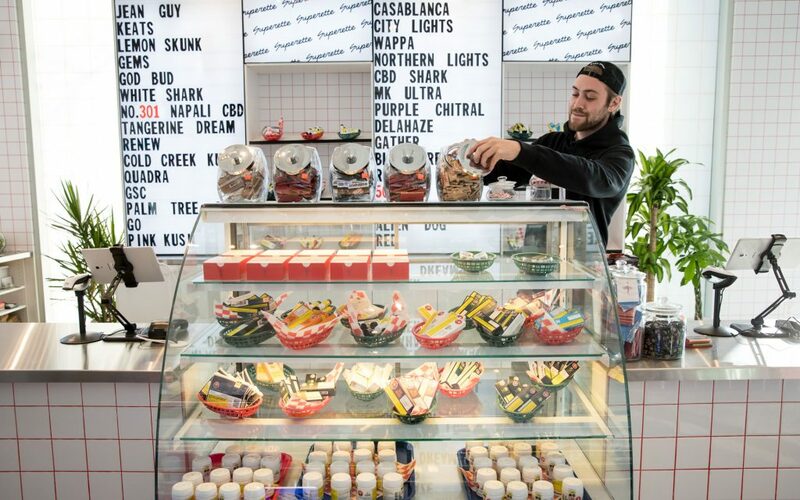 Selection-wise, Superette offers dozens of types of flower, pre-rolls, and oils. 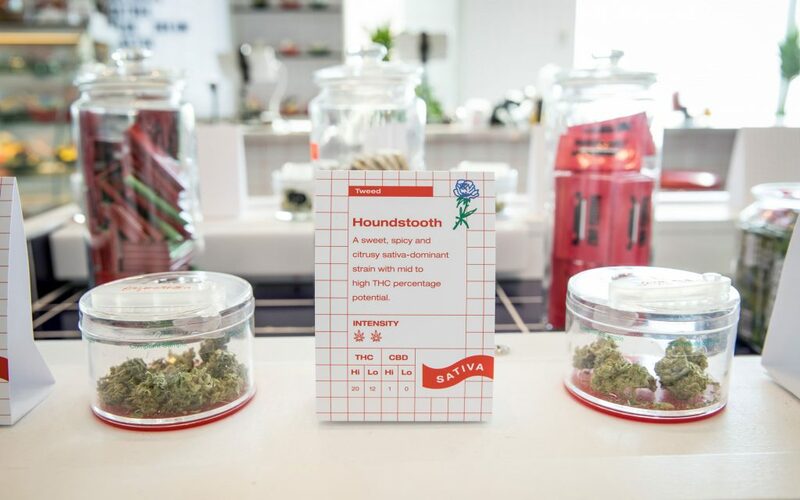 Select buds are on display at central tables but printed menus list the entire inventory organized under the headings: indica, sativa, hybrid, and listed by brand. 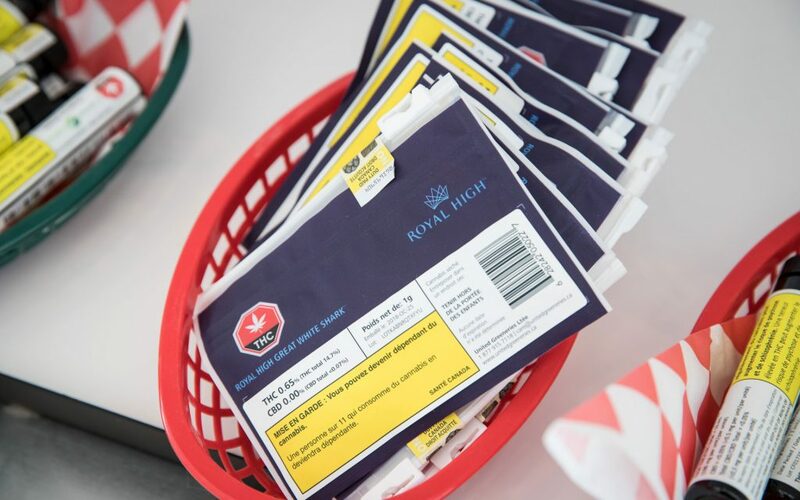 Prices are on par with the Ontario Cannabis Store ranging from $7.49 to $16.99 for a single gram. Aside from cannabis, find everything you need to start smoking, vaping, and/or baking. A wide variety of grinders, papers, pipes, storage solutions, and infusers stock the shelves. Customers are greeted by security at the front doors and are required to present a valid ID before entering. 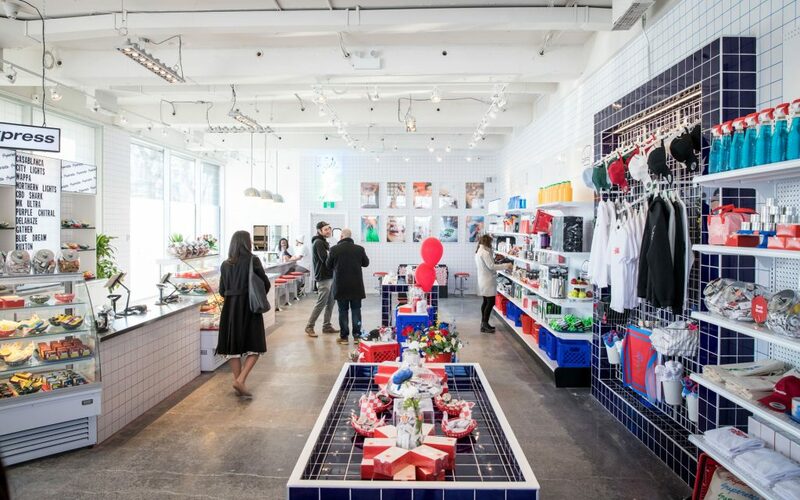 And, while branded Superette merch is on display throughout the store, much of it can’t be sold alongside cannabis per provincial regulations. To score one of the sweet totes, t-shirts, or hats, you’ll have to rely on off-site pop-up shops to make a purchase.